Flag Day is a public holiday in Kyrgyzstan. This holiday was adopted relatively recently and it is celebrated annually on March 3 since 2010. Flag Day in Kyrgyzstan was established by the Presidential Decree in 2009. The holiday was observed for the first time in 2010. The date of the holiday coincides with the anniversary of adoption of the modern state flag of the Kyrgyz Republic, that was on March 3, 1992. 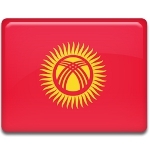 The Kyrgyz flag consists of a red field and a yellow sun in the center. The sun has 40 uniformly spaced rays. The sun also has a red ring in the center, crosses by two sets of three lines, which is a stylized representation of the crown of the traditional Kyrgyz yurt. The state flag of Kyrgyzstan has its own symbolism. Red color stands for bravery and valor, and the sun represents peace and wealth. Tunduk (the Kyrgyz word for description of the crown of yurt) represents the family home or universe. 40 sun rays represent the 40 tribes, that were united against Mongols by the epic hero Manas.